EB-14 drifts into the siding at Big Chimney, WV. The track plan for the layout is shown in the stone age drawing below. When I drew the plan back in the early 1990's, I used HB lead because it was easy to erase. That made the drawing too light to scan, so I eventually went back and re-traced it with darker lead. It's still pretty rough, but it depicts the basic layout and features of the railroad. I've made several attempts to draw it with some of the layout design software that's available now, but it always ends up being a lot of time and effort for something that's already complete. The Chesapeake,Wheeling and Erie is a small class 1 railroad that runs from Erie, PA to coal docks on the Chesapeake Bay. The railroad was constructed primarily as a coal hauler to take coal from the mines in West Virginia and Pennsylvania to Great Lakes and Tidewater ports (think Virginian). The line runs south from Erie, PA, has a branch that goes to Wheeling, WV and one that runs east to Pittsburgh, PA, and then heads into West Virginia. The layout represents a portion of the line from approximately Thomas, WV to New Market, Virginia. The main line then runs through Virginia to the Chesapeake Bay. The "Central Belt" moniker comes from the geographic location of the railroad. 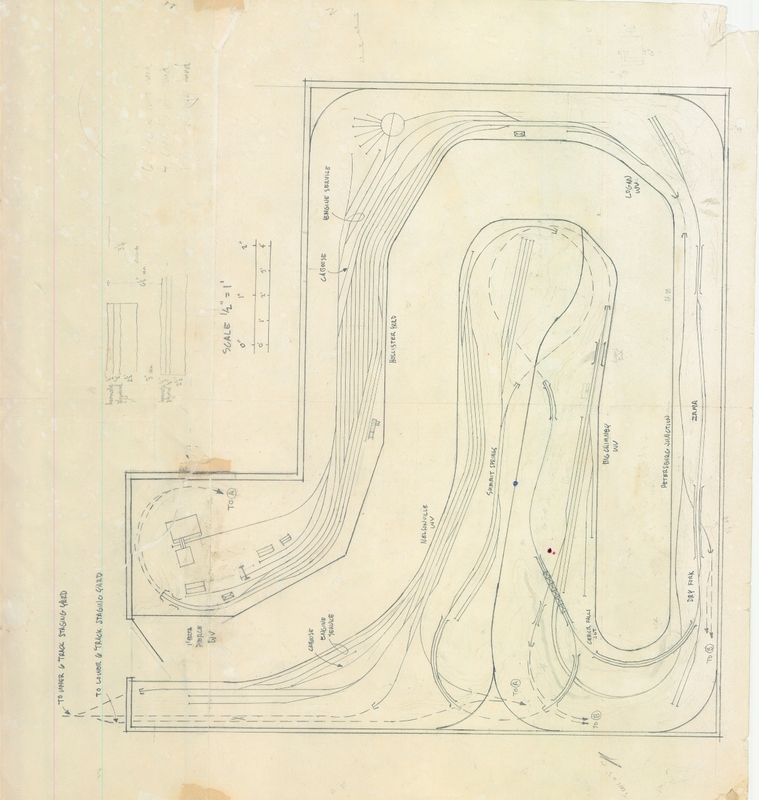 The layout is point-to-point with two 6-track staging yards (one above the other) located in an adjacent room. 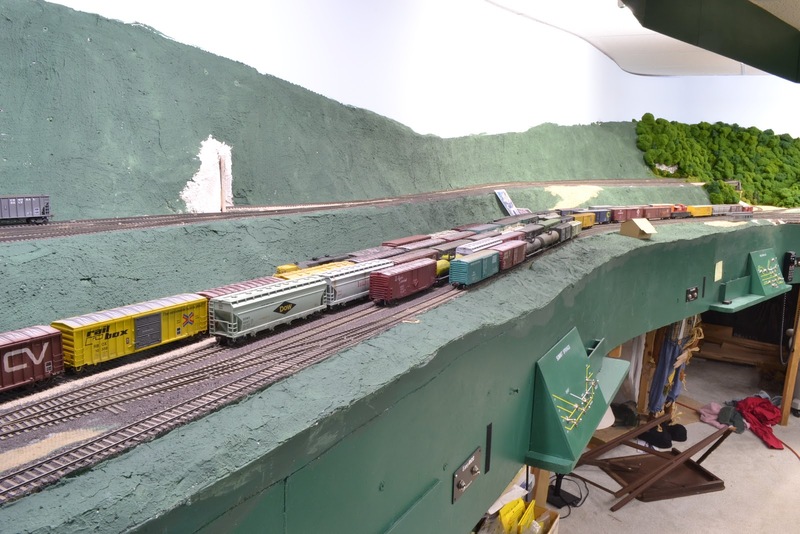 The main line enters the layout from New Market (staging) and the first stop is Nelsonville, VA. There is a small yard here along with an engine servicing facility. Two branch lines leave the main here: the Dry Creek Branch and the Wilson Bridge Branch. The Wilson Bridge Branch Branch serves as the yard lead for Nelsonville and proceeds into staging. The Dry Creek Branch actually connects to the other side of the layout by running through hidden track around the perimeter of the room (more on this design flaw later). There is a connection between the main and the Dry Creek Branch that serves as a wye to turn equipment. The photo below shows the yard at Nelsonville with the main line at Summit Springs running up above the yard. After leaving Nelsonville, the main line continues to Summit Springs where a large coal preparation plant is located along with a smaller tipple. You can see photos of the prep plant on this post: http://cwerailroad.blogspot.com/search?updated-min=2011-01-01T00:00:00-05:00&updated-max=2012-01-01T00:00:00-05:00&max-results=5. Many of the locations on the layout can be seen on previous posts. The main line then crosses the Dry Creek Branch and punches through the summit (backdrop) to the other side of the mountain. At Sand Fork Junction, the Sand Fork Branch leaves the main and heads up the holler to serve three separate mines and a team track. The main line continues from the junction down the 2.5% grade to Big Chimney, WV. There are several industries and two coal load-outs located here. The Elkwater Branch also leaves the main and enters a two-track staging yard that connects back to the main at Petersburg Junction. After leaving Big Chimney, the main line crosses under the Sand Fork Branch and continues to Petersburg Junction, where the Purgettsville Branch comes in from staging. The main line then continues to Hollister Yard at North Pierce, WV. Hollister Yard serves as the coal marshalling yard for all of the mines and load-outs west of Sand Fork Junction. The yard includes an engine service facility at one end and a car repair facility, including two RIP tracks, at the other end. Numerous mine and branch runs are dispatched from Hollister Yard, and way freights make set-outs and pick-up here. There is also a local yard job that services the industries in and around North Pierce. After leaving North Pierce, the main line enters staging and runs around the perimeter of the room to connect with the Dry Creek Branch. There is a 6-track staging yard along the wall beneath the main line and Sand Fork Branch that is all but inaccessable now. Hidden staging is great, as long as it is easily accessable. Cars will derail, track will move and things will need to be cleaned/checked regardless of the care taken during construction. The 6-track staging yard that is now unusable will be replaced with a 12-track staging yard that will be located in the other room and will represents locations and connections to the west. The main line will leave North Pierce on a single track and will punch through the wall to staging. The two bridges will be removed and the scenery will be re-done in this area. This will fix another problem with the layout- I absolutely cannot reach the scenery at the back of this area, even with a creeper. I have no idea what I was thinking when I built the scenery so deep here. The other two 6-track staging yards will now be used for connections to the east and the Wilson Bridge Branch. My friend Stuart Thayer has been scheming to have a run-through freight from some foreign road connection come on the line from this branch along with some foreign road power to jointly switch the tipple at Nelsonville. A lot of new ideas for operating the layout have come out of the recent operation sessions, and I'm excited about the possibilities for expanding operations. The Chesapeake, Wheeling and Erie Railroad held its second operating session this past Saturday. A few new trains were added to the schedule and the gremlins were held at bay for the most part. But most importantly, everyone had a good time. We dispatched using track warrants, which are a little too new for my era of the mid-1970's but work really well for the current set-up. We use car card and waybills as shown in the photos below. I also included a train card which provides information about the specific movement such as origin, destination and work to be done. To assist crews in spotting cars, I'm using the Train and Industry Blocking System, or TIBS, that Dan Holbrook developed for the Midwest Railroad Modelers layout back in the late 1980's. The system uses alpha numeric codes for blocking trains and spotting cars on the layout. You can see the code in red in the upper left hand corner of the waybill. There is a corresponding alpha numeric code on the panels on the layout for each of the on-line industries. Several crew members commented on how helpful the codes were, especially since everyone is new to operating the layout, myself included. The schedule included eight trains: 1) an eastbound and westbound way freight which made set-outs and pick-ups; 2) the Elkwater Branch turn that comes from staging into Big Chimney, WV, makes set-outs and the proceeds to the yard at North Pierce, WV; 3) the Dry Creek Roustabout that leaves staging and enters the small yard at Nelsonville; 4) a westbound coal extra with empties; 5) an eastbound coal extra with loads; 5) the Big Chimney Roustabout, which runs from North Pierce to Big Chimney and back as a local turn; 6) the Sand Fork Mine Run, which works the tipples on the Sand Fork Branch; and 7) the Nelsonville Yard Job, which classified cars coming off the Dry Creek Branch and assisted the way freights with set-outs and pick-ups. In the photo below, Stuart Thayer has taken the SD40/SD40-2/SD40 lashup from COXE42 to the "house" at North Pierce. Next up, Anthony Hardy is getting ready to bring the Dry Creek Turn into Nelsonville. 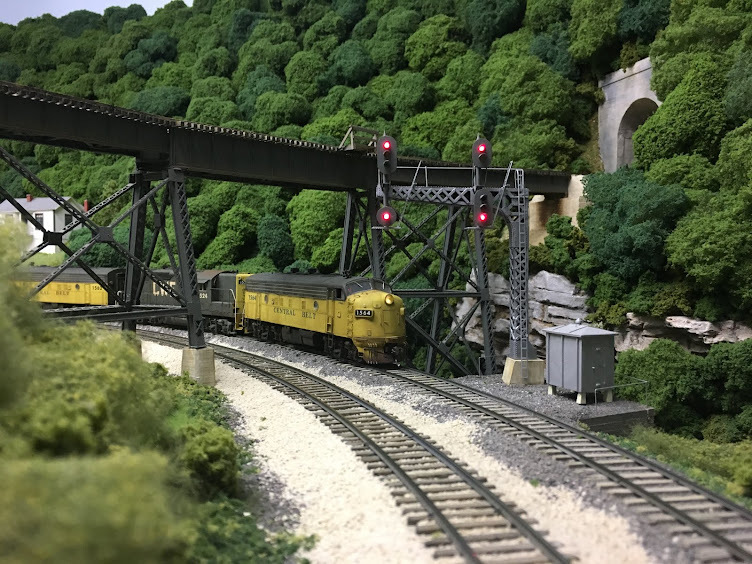 And in the photo below, Bill Ford and Ron Parrish have just brought the Elkwater Branch Turn into Big Chimney and have set-out two wood chip hoppers on the Helper track. Michigan Interstate St. Clair Sub.